You might have heard this before. Electricity and plumbing are analogous. In one case you have electrons flowing in a wire, and in the other case you have water flowing in a pipe. 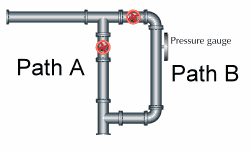 The thing that makes water move in a pipe is pressure. The thing that makes electrons move in a wire is voltage. The amount of water moved in a pipe is measured in gallons. The number of electrons moved, or the amount of charge moved through a wire is measured in coulombs (a coulomb is just a fixed quantity of electrons, like a dozen, but bigger). Now the question is how do you measure the rate of flow, or current in one of the paths? Pressure or voltage is relatively easy. 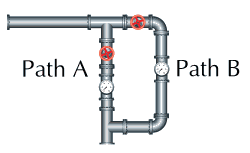 In the plumbing case you just drill a hole in the pipe and add a pressure gauge. In the electrical case you connect a volt meter between the point of interest and the ground. 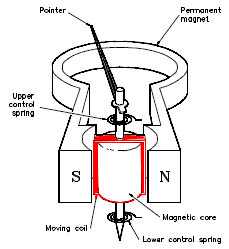 Electric current will always be associated with a magnetic field. Let's first look at the use of Ohm's law. Assuming that voltage is easy to measure, what you do is introduce a known fixed resistance into the circuit. Then the voltage measured across the resistor is proportional to the current flowing through it. To make a good measurement the resistor must be precise in value and stable (not change resistance with temperature, pressure, illumination, etc.) And in order to keep from disturbing the circuit too much it must also be low in value. 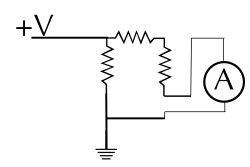 This resistor is often erroneously known as a shunt resistor, but a better term for it is sense resistor. 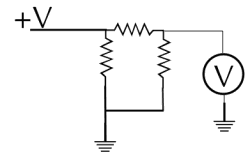 According to Ohm's law V = I·R if the sense resistor is 1 ohm, then the voltage across it will be 1 volt per amp. Here is a practical use of this technique. Here the engineer is trying to control a power circuit. Q1 is energizing the transformer T with pulses, but he needs to know how much current is flowing through the transistor during the pulse. He uses resistor R8, which is only 0.03 ohms as a sense resistor. 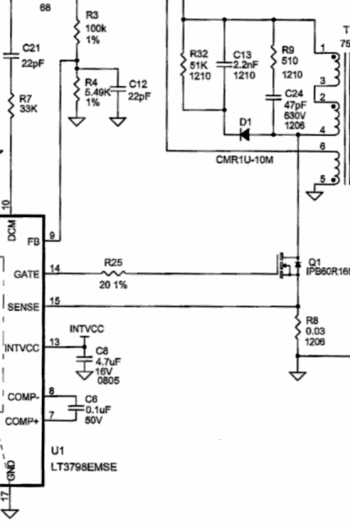 For every amp flowing through the resistor 0.03V, or 30mV appears across it, which is detected by the sense input of the PWM controller, Pin 15. 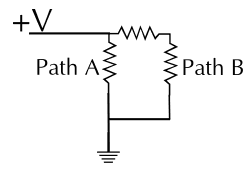 The PWM controller uses this data to control the current, voltage or power output of the power supply, depending on the rest of the circuit. One of the earliest ways to detect electric current was a few wraps of wire around a compass. D'Arsenval extended this idea to make an amperage measurement device (ammeter) by putting a coil inside magnetic poles with bearings and watch escapement springs. This is the way that analog meters work today. Another way to make use of the magnetic field is with a clamp on DC ammeter. These use the Hall effect to measure very weak magnetic fields created by electricity in a wire. These are fairly recent inventions, and are extremely convenient, since in this case you do not have to cut the wire to insert a traditional ammeter.